I recently had an “interesting” time getting a LaserJet 4 (model C2001A) to work with the current version of Windows 10. Now, if you are not familiar with this model it’s a 25 year old printer from 1993 and still works without issue. I frequently see modern inkjet printers give up after a year or two so it was good to see this old timer still doing a job and producing page after page with only a minor squeak from its ageing cogs. A bit like I feel sometimes! It’s worth remembering this printer only has a Parallel Printer interface. Something that vanished as a standard on modern computers a good few years back. Luckily the PC was a Dell Optiplex 330 Core 2 Duo Tower which has the required Parallel Printer port so we didn’t have to add an after-market card to the PC or USB to Parallel cable. The problem was the new boy on the block. Windows 10 didn’t want to play with the old timer and refused to let any of the HP LJ4 drivers install. We tried all the obvious solutions but nothing would persuade them that the printer was there or that the driver was compatible with Win10. So, stab in the dark and tried a driver for the LaserJet 3390 … and it installed OK !?! A test print confirmed it was working OK, the correct bin selected etc. Had to change the paper size from Letter to A4 – no biggie. The only issue found so far is that Win10 doesn’t like shutting down or restarting with the printer on. A minor issue that is easily fixed by simply turning off the printer before shutdown. 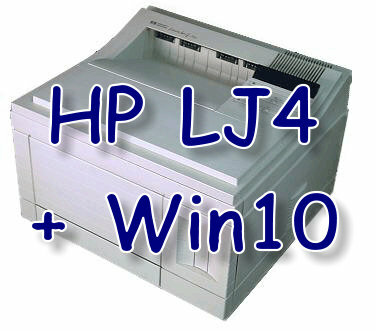 This can also unset the default printer on restart but, again, its simple to change printers. If these are the only issues when using a 25 year old printer then they are livable with and we can look for solutions in due course. I wish I could say it was an educated guess but the 3390 was just near the LaserJet 4 in the driver list. So there you go. Sometimes the best solution is not to keep banging your head on the door hoping it works but sidestep the issue and trust to luck. Computers. Don’t ya just love them ! Did you like the “old school” image? Drop shadow, text embedded in the image, white outline and Comic Sans font … and yes, just to complete the blast from the past, this page is in Times New Roman. Ah, simpler times. Thank goodness they are now distant memories ! Posted in Computer Support, Support, Tips.